First published in 1984, this book made an important and timely contribution to the development of the idea that the law is a major source of women's oppression. 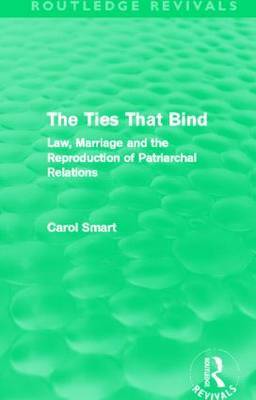 Based on research of the theory and practice of family law, it examines the way in which private law operates to sustain, reproduce and reinforce the dependence of women in the most private of spheres, namely marriage. The author focuses on the point of break down or divorce, where the economic vulnerability of women caused by marriage and the sexual division of labour is most clearly expressed. She points to the way in which the law, while mitigating the worst excesses of men's power over women in marriage, has consistently failed to tackle the economic structure of marriage and women's fundamental material vulnerability inside the family. She confronts various myths on divorce legislation in Britain and discusses alternative feminist proposals for tackling the problems caused by women's economic dependence in marriage. Although Smart writes in 1984, many of the issues she discusses retain their significance in today's society.